have not kept up with community growth and the commercial and industrial facilities they service. Water and waste water projects have been shelved due to lack of funding and the economy. In these developed areas, impervious surfaces, pavement and roofs prevent soil absorption which interferes with the natural hydrologic process of filtration and collection to our aquifers. erosion, SSOs/CSOs, etc. Ultimately the municipality is responsible for discharges and effluent requirements per the storm water permit. Green building programs such as Leadership in Energy and Environmental Design (LEED ™) and sustainable development programs such as Low Impact Development (LID) have gained traction and established a blue print for storm water management. Both LEED and LID create frameworks for protecting streams and waterways from degradation caused by unmitigated storm water runoff. As part of the Environmental Protection Agency (EPA) Phase 1 storm requirements, all States, counties, cities, etc., are responsible for developing solutions to control pollutants from runoff from industrial facilities to municipal separate storm sewer system (MS4). This is also covered under the National Pollutant Discharge Elimination System (NPDES). mitigating the negative impacts associated with urbanization. This new approach has introduced dynamic storm water management tools that mimic the natural hydrology of a site without the dependence on structural practices. Tools such as riparian buffers, green roofs, bio filtration swales, retention/detention systems and rain water harvesting address multiple objectives like water and energy conservation. An article recently printed in the Tennessean highlighted the financial struggles faced by many municipalities around the country. The municipality in Nashville TN faces backlogged storm water management needs totaling $200 million dollars. The article outlines the steps and proposals needed to fund the Metro’s storm water related projects. Mayor Barry announced what she billed as a new “modernized and equitable” storm water fee structure. The increase would be the first of its kind since the Metro adopted the fee in 2009.
fairer and will allow us to fund critically needed projects throughout the city”. This article, in brief, clearly defines the tools needed to reduce runoff and improve water quality by introducing “Green Infrastructure.” Highland Tank provides solutions in technology that infiltrate, evapotranspire, capture and reuse storm water to maintain or restore natural hydrology. protected with your choice of high-solids polyurethane, epoxy and other tough internal linings and external coatings. One of the most dynamic storm water management tools Highland Tank has added to its tool box is Rainwater Harvesting Systems. Harvest is a holistic two-prong approach to quantity and quality control. 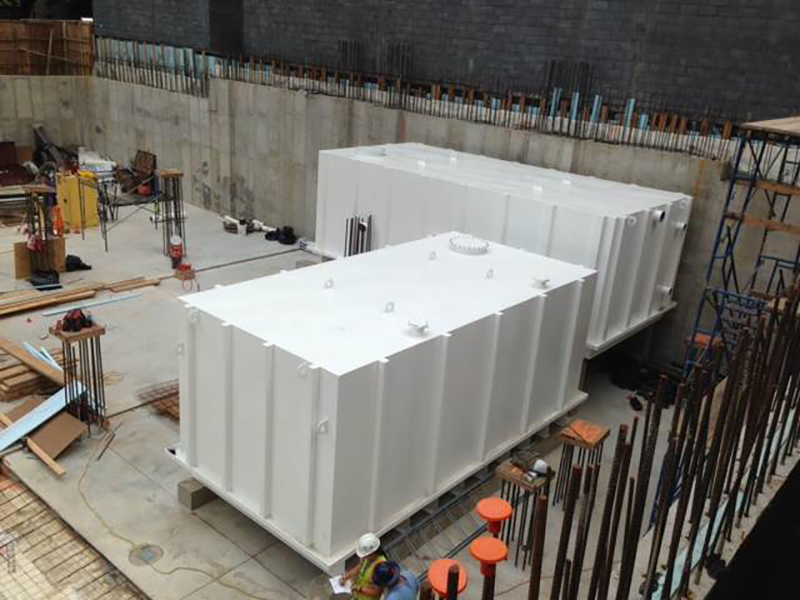 In operation, the storm water is diverted from the sewer system through the use of underground cisterns coupled with prefabricated water treatment packages that recycle the storm water on-site. cooling tower makeup, washing of sidewalks, streets, or buildings, and laundry systems. Highland Tank’s HighDRO®-Pure System is designed to collect, store, process and treat rainwater from a storm event for future reuse. It helps reduce storm water runoff and provides an alternative to using municipal water supplies. in municipalities with finite water resources. LEED architects, engineers and builders have long recognized Highland Tank’s protected steel water tanks for their strength, durability and functionality. With the addition of our new HighDRO®-Pure systems, we are continuing our commitment to protect the environment and conserve our precious natural resources to benefit our world today and tomorrow. previous post: Highland Tank’s High-Quality HighDRO® Fire Water Storage Tanks — Don’t Get Burned!